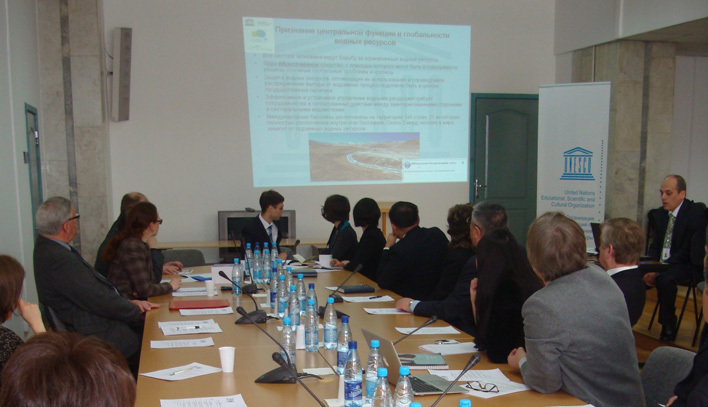 On 20 March 2012 UNESCO Almaty Cluster Office in cooperation with the Office of the UN Department of Public Information/UN Information Office in Kazakhstan organized a round table discussion dedicated to the World Water Day. More than 30 experts, specialists and students from different organizations and Universities (Institute of Geography, Institute of Hydrology and Geoecology, UNDP, Ministry of Foreign Affairs of the Republic of Kazakhstan, MAB National Committee and others) participated in the round table. During the meeting the 4th UN World Water Development Report (key messages overview) and results of the 6th World Water Forum (March 12-17, 2012 Marseille, France) were presented. Presentation of publication on IWRM in Ili Balkhash basin (prepared in framework of UNDP funded project); Review of “MAB” National Committee activities; Presentation of updated course on IWRM recently developed by UNESCO; Up-date on the status of the opening of Sub-regional Glaciological center in Almaty (UNESCO center category 2) have also been presented and discussed during the round table. Participants were particularly interested in a wide range of issues presented in the 4th UN World Water Development Report, and were provided with relevant information in respect of the UNWWDR4 and the 6-th WWF materials.